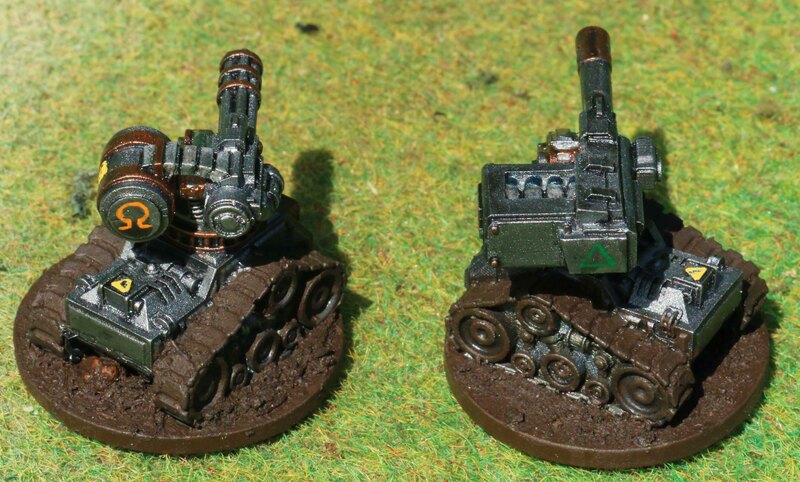 And last are some minis for Warzone, to complement my already large Imperial force. In this case some Life Dragoons from the Young Guards Regiment. Since these are the Imperial Serenity (= the head of state) and Imperial is based on modern-day Britain, I felt I should rather go with a classic paint job (both in a historic British sense as well as in the sense that they are depicted this way in all the classic artwork). So it was scarlet jackets and dark blue trousers with red piping. I have to say… this is where the problems began. They are always depicted with black armour and berets, so I kept those. The big problem was, that this made a large area of the minis rather dark and the colors did not really contrast each other. About the only part of the minis to provide some contrast was the gas masks, but they looked rather strange with their large napkin like collars. And it continued with the rest of their equipment. Begin a guard unit that is always depicted in their colorful uniforms even if in the field, I felt that their belts, pouches, webbing and so on should not be green. Them wearing backpacks in white did not seem right either, so I went with a light grey. Which while keeping with the theme, did not really improve the contrast either. But the minis were plagued with other problems from the beginning. They are made from resin and when I bought those three packs the resin with the weapon sprue on all three packs was extremely soft. I contacted the manufacturer and got replacement sprue without any argument. But unfortunately those replacement sprue were suffering from lots of flash. So there was lots of work to put into these in the first place. Another problem is the weapons in the set. Two in five men may be armed with either an automatic shotgun, a mortar and / or a sniper rifle. 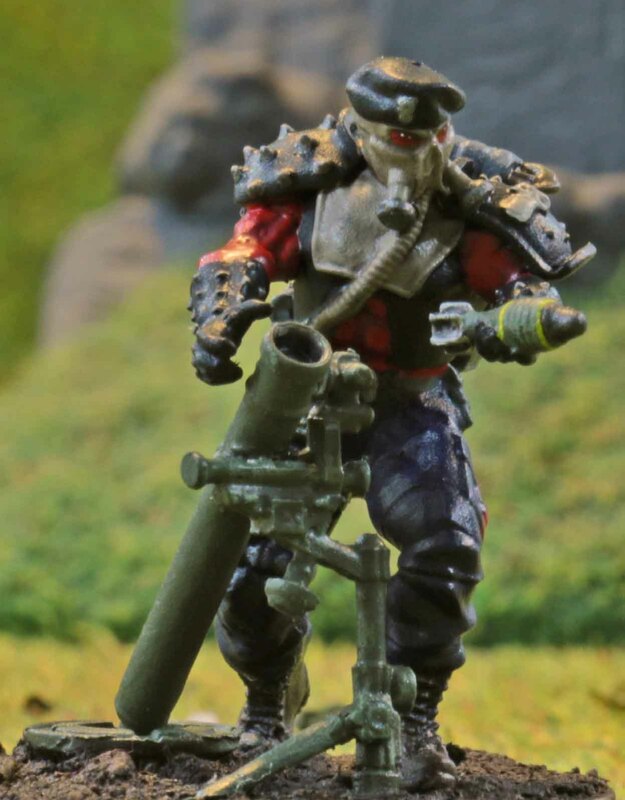 The set only comes with an optional mortar and sniper rifle and both for the kneeling mini. So some conversion work was required anyway. To men were converted to shotguns (from another set) and one of the standing guys became a loader for a mortar as well. Since I did not like the pose of the trooper spreading his arms out, I converted one of those to a firing pose. And while I was on it, most minis also received bi-pods, optics and laser designators to make them look better geared out. It seems, this is one of those cases where I waited too long posting something. About two months ago I played my league game with Björn. Which means that by now my memory is a bit fuzzy, but I am going to try my best to summarise the game. It was somewhat special. 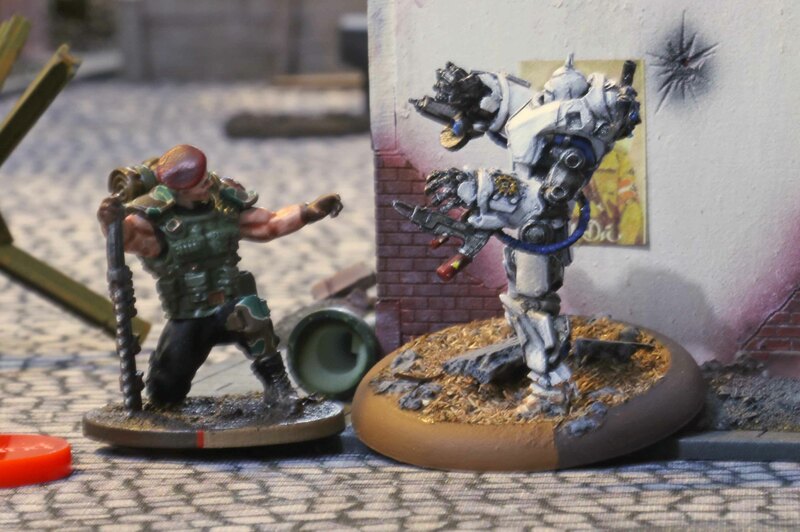 Since one of the other members of our group and myself were on the team redesigning the factious for Warzone, I had access to the new Bauhaus rules, before they were published. Therefore it was not only a league game, but also a playtest for the new Bauhaus. In addition we decided to play a somewhat larger game, playing 1500 points and a Mega OOC. 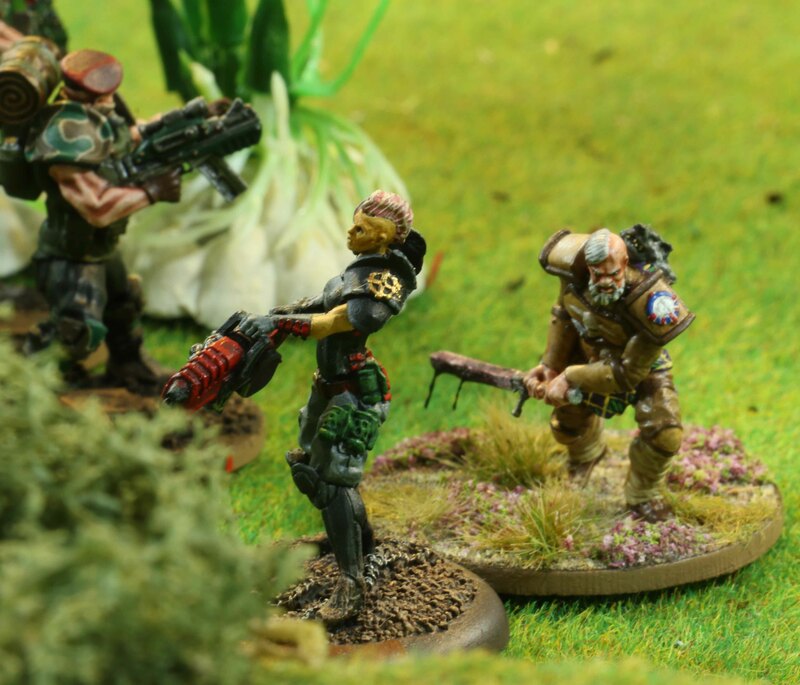 Bauhaus were led by Angelica Drachen and featured four squads of Hussars, two squads of Etoiles Mortants (only one with Rapid Deployment), two squads of Juggernauts, one squad of Venusian Rangers and two close combat Vulkan Battlesuits. 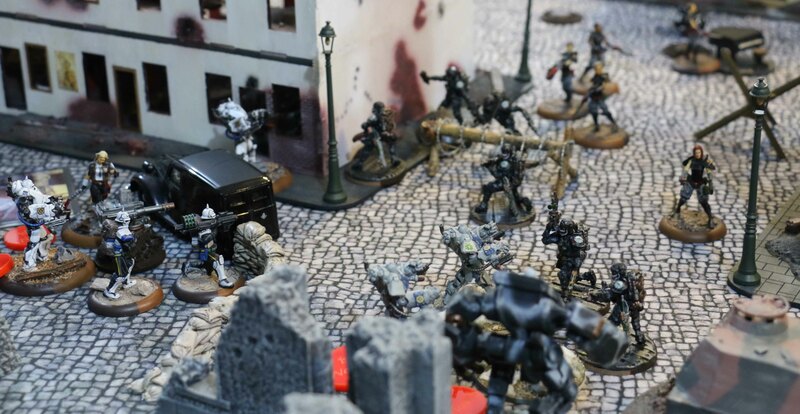 Imperial were led by a close combat Blood Beret Custom Warlord, four squads of Trenchers (one led by a NCO with Imperial Banner), four squads of Imperial Special Forces (two of them Infiltrating Black Berets), one squad of Life Dragoons / Young Guards, one squad of Blood Berets with plasma carbines, one large squad of Blood Berets with Heavy Chainrippers led by SGT McBride and accompanied by Isaac Alfreds and a single Grey Ghost sniper. 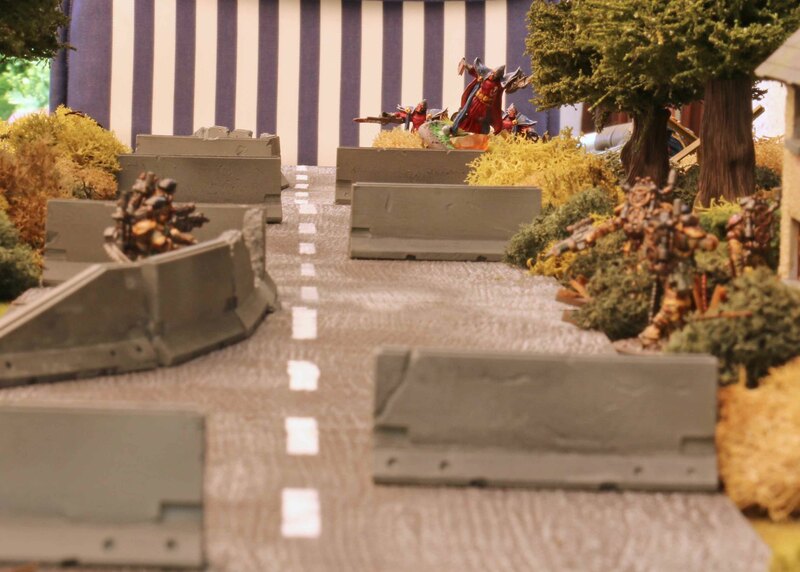 We played on a table with inner city run-ins and rolled a scenario where one side had to control three objective markers along the centre line by the end of turn 3 or later. Before the game started, Björn was unlucky with his Bauhaus. I had won the set-up initiative and placed my Infiltrating units first. 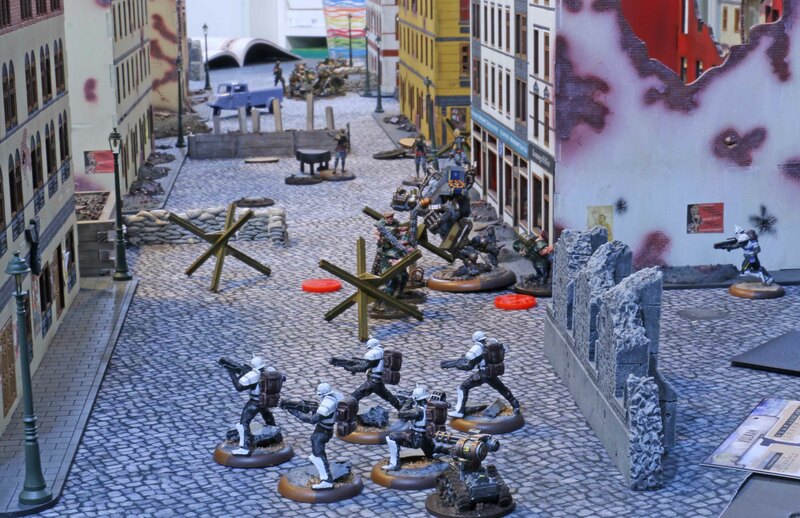 Due to the sheer number of infiltrating units on the Imperial side (four in total) virtually every spot on the table where one could infiltrate was already taken when it was the Bauhaus infiltrators turn. 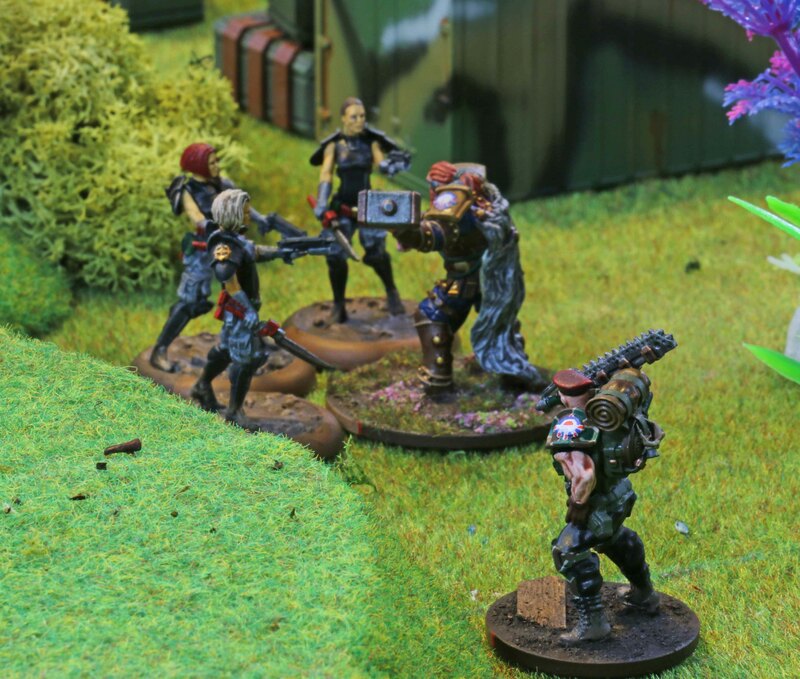 Which meant that the first squad of Etoiles Mortants had to set up in their own deployment zone and the Venusian Rangers could only set up slightly in front of it. 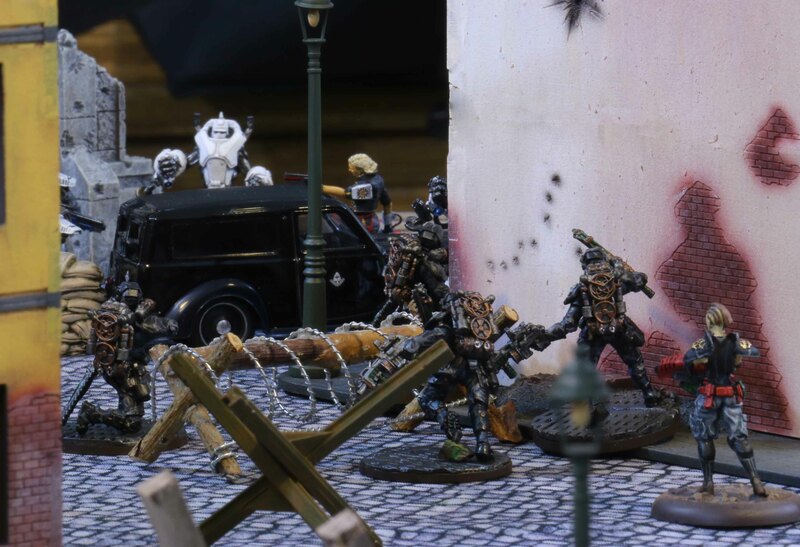 The game started with the two squads of Black Berets that had infiltrated into the centre of the table rushing forward, attacking Angelica Drachen, a squad of Hussars and Juggernauts with their chainswords, rifles and flamethrowers. 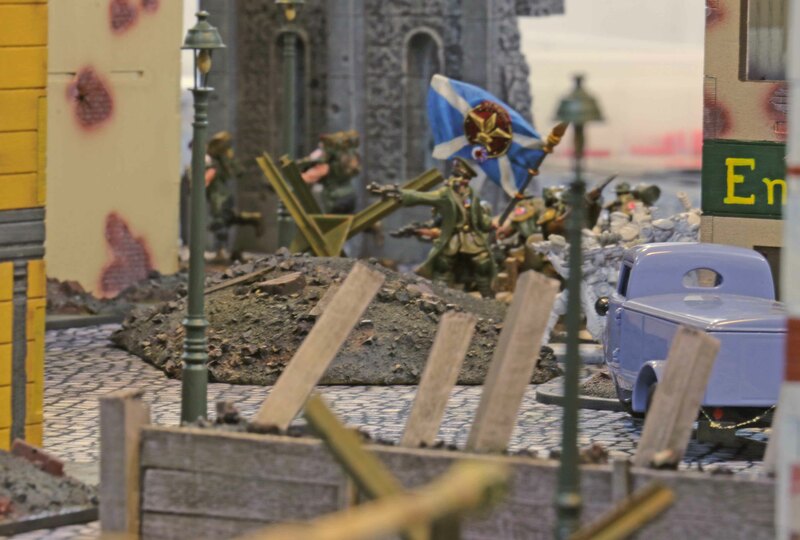 But they were not too lucky, as Bauhaus losses were minimal and they hardly caused any wounds to the Juggernauts or Drachen. In return they were counterattacked by their Bauhaus adversaries as well as one of the Vulkans. In addition, the second squad of Etoiles Mortants parachuted in to take them on. 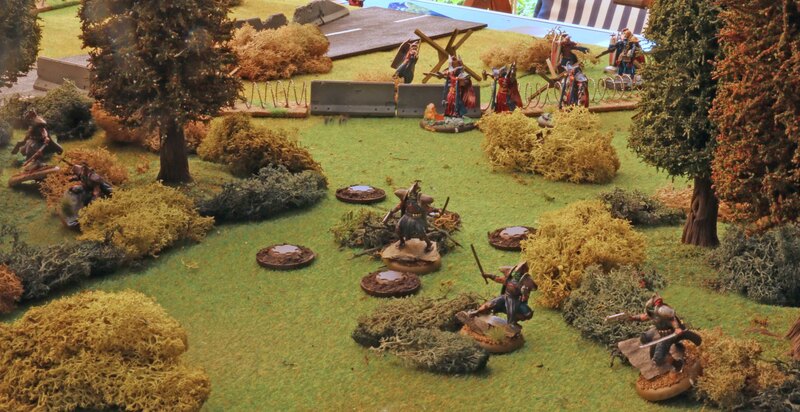 Even though one of them was pretty lucky with his Heal Rolls, the last of them perished early in the second turn. 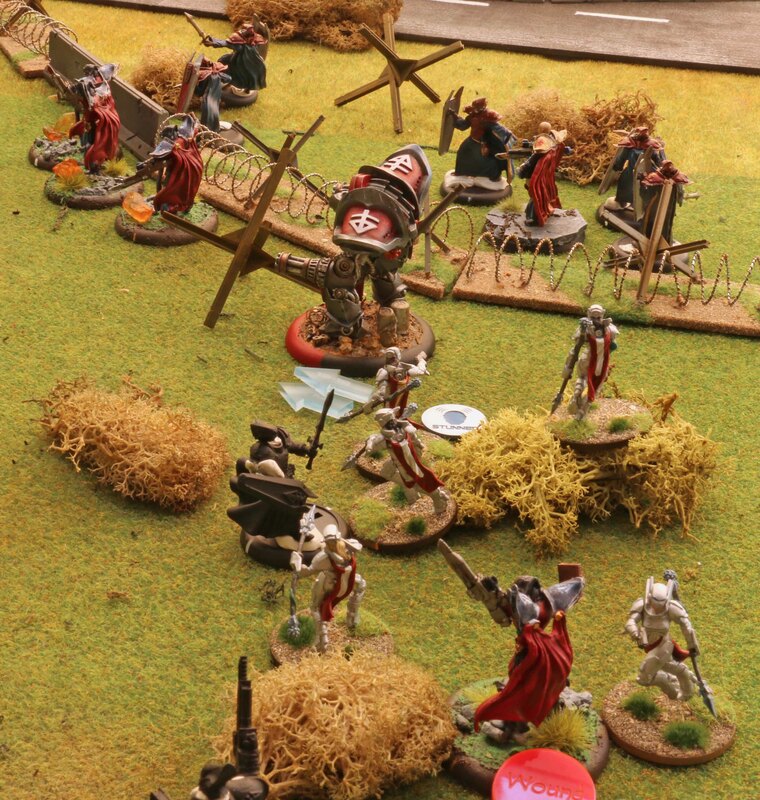 On the left flank there was a constant slugging match between the Life Dragoons and the Venusian Rangers supported by a squad of Hussars. 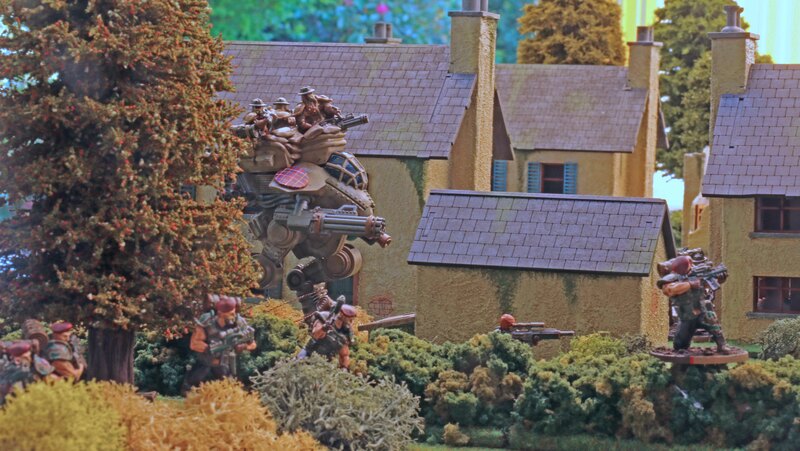 Due to the heavy cover, both the Dragoons and Rangers were in and their camouflage skills this led only to minimal losses, until two of the Dragoons charged to of the building and fired their automatic shotguns at the Rangers, taking them out of the game. On the right flank things were even more heated. 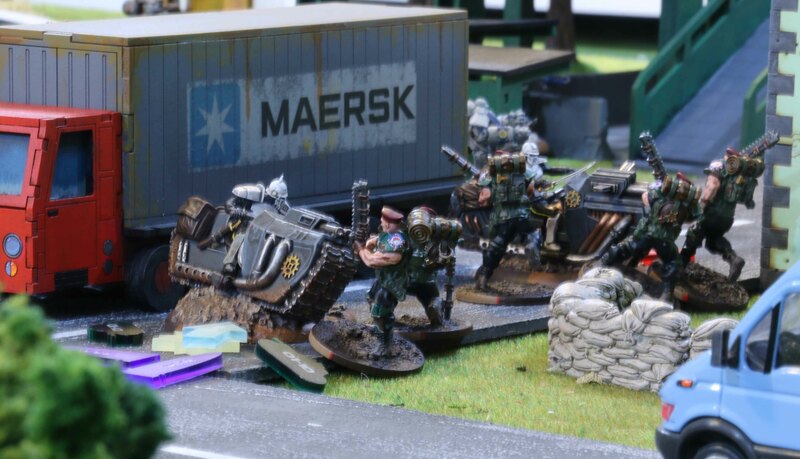 Even tough the close combat Blood Berets had infiltrated onto the table, they were far from the enemy and took heavy losses on their way in. But once they were close to the enemy, their Heavy Chainrippers made short work of both the Hussars and Vulkan. Even one of the Juggernauts that had charged them through the ruins could not turn the tables and was taken out as well. After I was done with those Flemish Mercenaries, I was waiting for the primer to dry on the Normans. 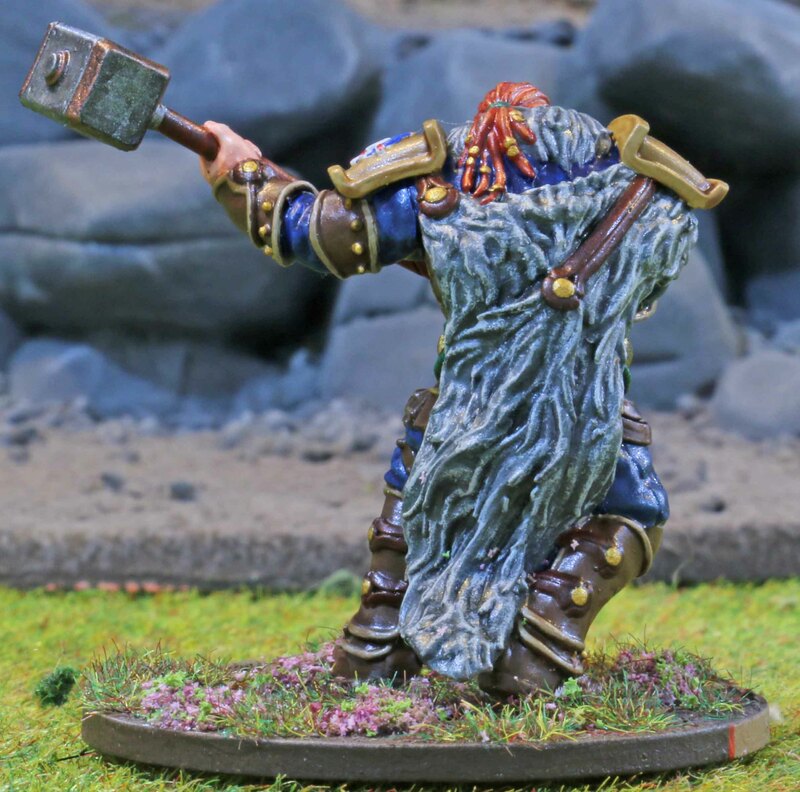 So I looked at the single minis I had ready for painting, to see which one did fit my mood. And it was Shiryo-X, one of the Mishima (War)Lords for Warzone. During the summer, I had already primed the model in a blue steel colour with top down highlights using my airbrush. So that was a good base to start from. I pin-point washed some of the panels with a diluted blue ink. This made those panels darker, while still retaining the metalic looks. Other parts of the armour were accented in gold. The rest was just a fairly straight forward paintjob. 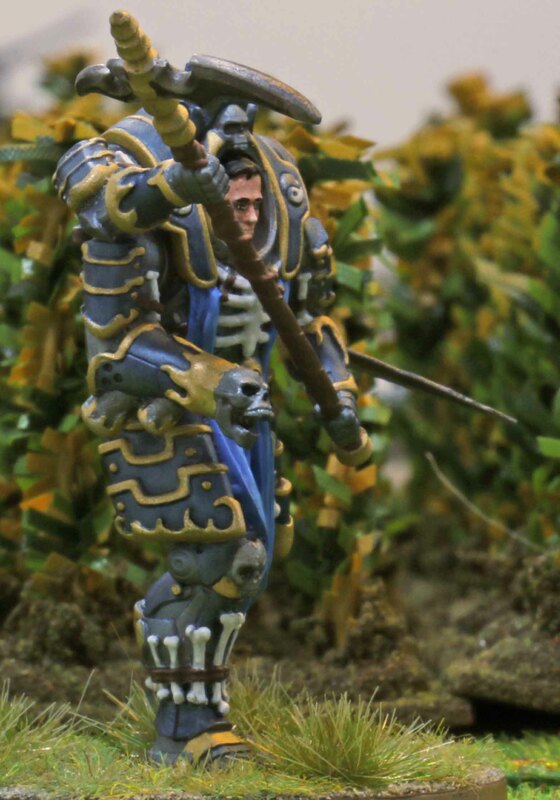 What really annoyed me where all the bones on the model. 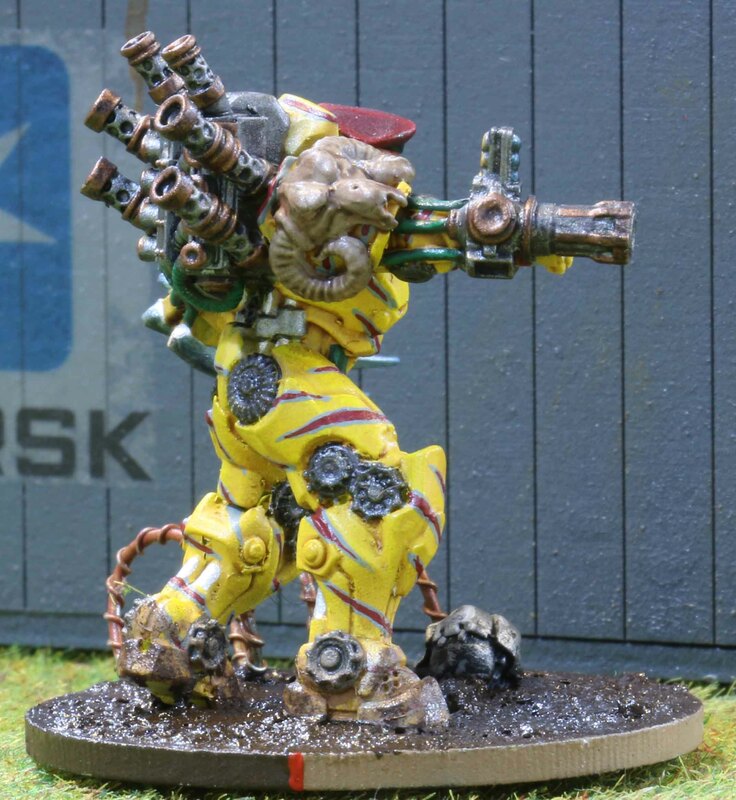 For one it gives the model a very 40K look. 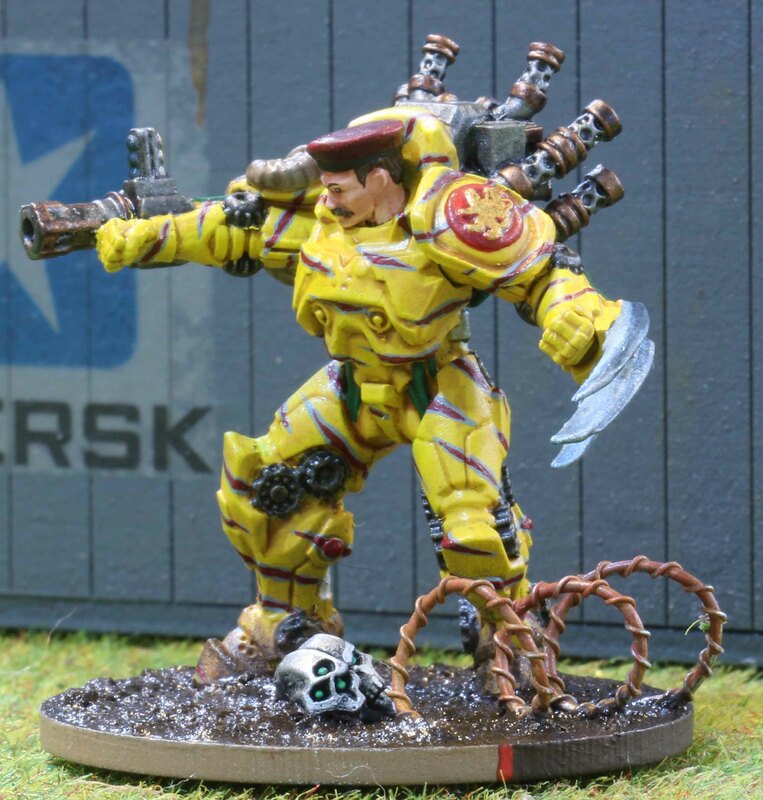 And I always liked the fact that Warzone models did not look like 40K models. It also annoyed me, since there is nothing in the fluff for this model that would explain him fitting all those bones (trophies?) to his armour. Assuming that they are trophies, this also gave me another problem. Brownish bones allow for some nice contrasts on the model. But bones are only brownish when the flesh, muscles and sinuses have rotted away. And I would not expect anyone to wait till everything has rotted off the bones. But if you remove all the tissue from the bones by cooking them off, the bones become white. This does not leave you much room for shading and highlighting on such small items. But it could not be helped. One thing that caused me a few problems was the Katana. I must have snapped it off while painting and could not find it afterwards. So I hammered a piece of wire flat and filed it to shape. Does not look as nice, but it will be much more robust. Games wise, this year has been strange this year. I playe a bout a dozen games (everything from SAGA, over Star Wars: Armada and Battlegroup to Warzone) that I played, but did not take photos of and thus never posted. But there are also a few where I took photos. I think now is the time to at least post those. Ithaca been a while since they were played, so the details have become a little too fuzzy for game reports. Hope you enjoy them anyway! 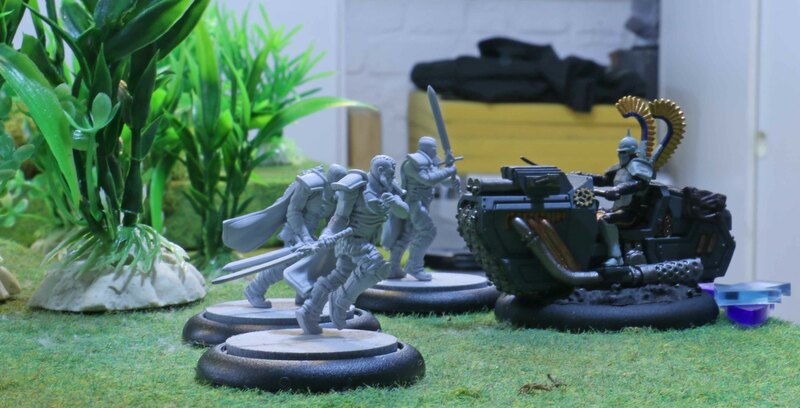 These are some Imperial Special Forces (ISF) for Warzone. Or to be more precise on the sub-unit… Black Berets. The Black Berets have always been my favorites in any incarnation of Warzone, mostly because I liked their Black and Grey uniforms. So there was no way for me not to paint them one more time. Their main mission is and always has been spacecraft boarding operations. And I think in this incarnation of the rules they are best suited for this. In this edition the rules the ISF got backpack teleportation devices. I think they are over the top on the average battlefield (and for that matter I could have done without them). But fluff wise they are great when it comes to boarding operations. No more docking to an airlock or cutting through the hull, giving the defenders time to mass their security troops there. You simply fly your shuttles close the the enemy ship and teleport into the next corridor. Sealed bulkheads or fortified corridors… no problem you simply teleport past those. 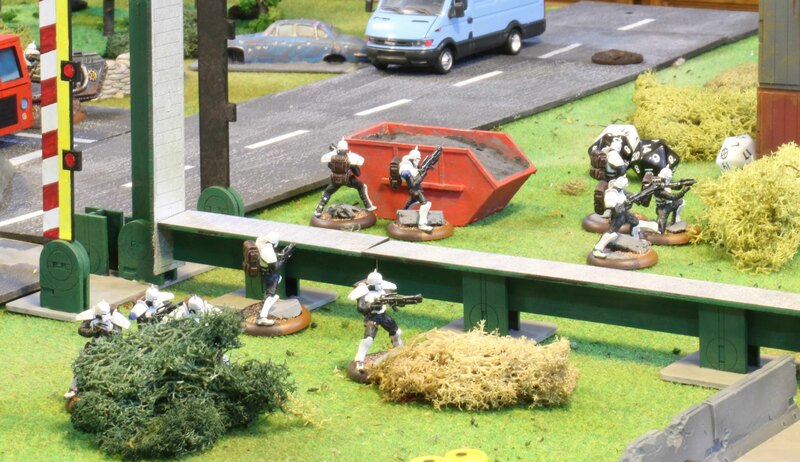 As you may have seen when I posted another unit, The Sterlings, earlier on, these minis are wearing gas masks, berets and diesel powered teleportation devices and those simply will not do in space. The backpacks were easy enough to change… simply remove the exhaust pipes and pistons and call it the nuclear version. While one can always assume their suits to be insulated and airtight (like any modern spacesuit), gas masks simply would not help. So I removed their heads and replaced them with full face helmets from Anvil Industries. Just like I did with the Sterlings, I removed they bayonets from their rifles (stat wise the models do not have them anyway) to give their rifles more of a carbine feel. 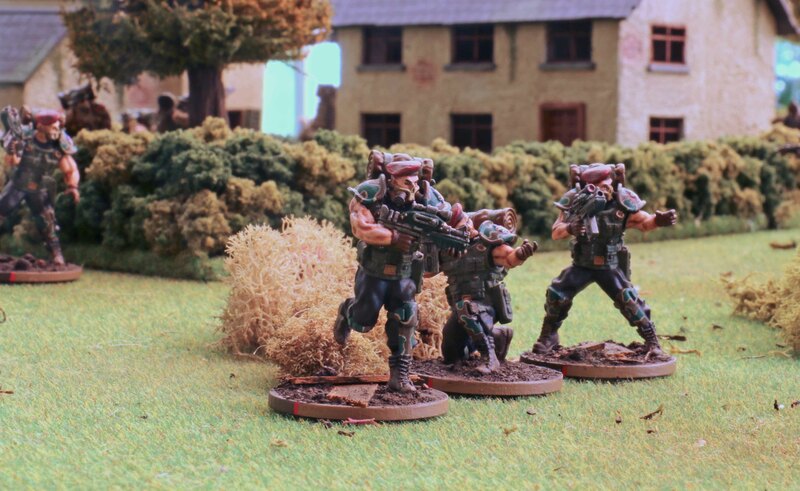 I also fitted their carbines with a lot of halo sights and forwards grips to give them more of a commando look. 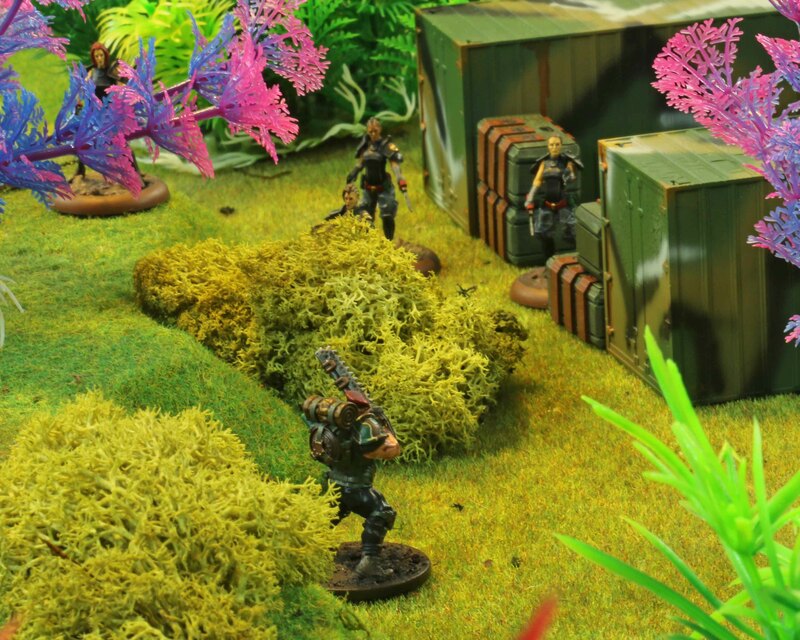 The last two soldier got the Gehenna Puker Flamethrower… nothing clears a corridor faster! So off to the painting table they were. I started off with the black armour and decided to paint their suits in a dark blue, to keep enhance their sinister looks. At this point I was slightly undecided which way to go. 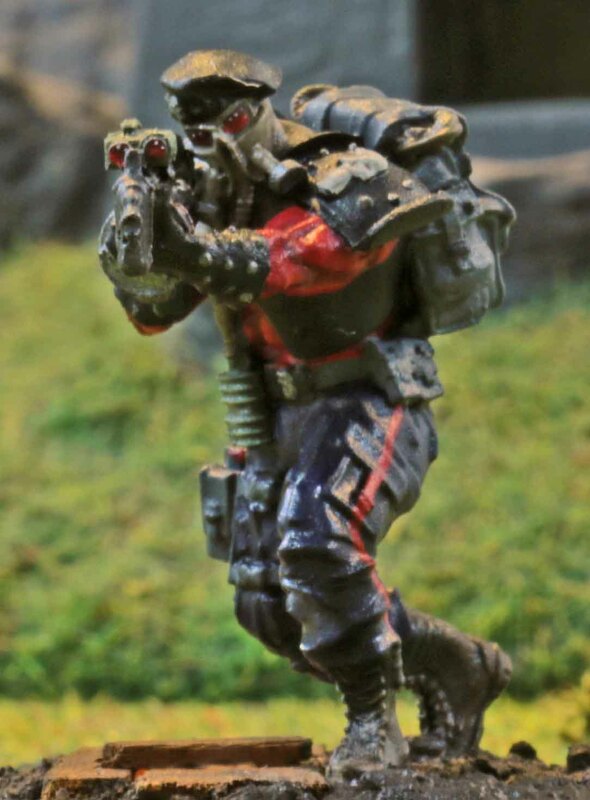 Black Berets usually have grey camo on their armour, but I already liked their looks as they were. 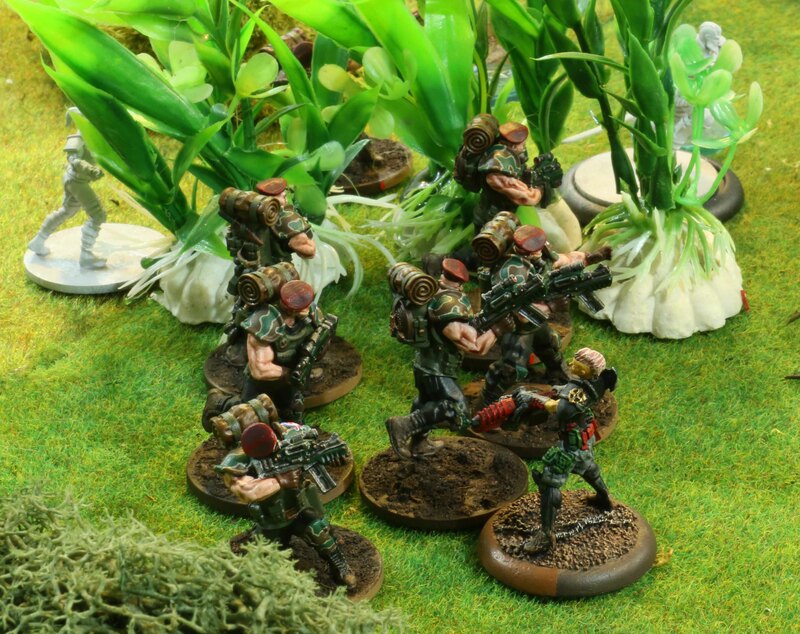 The biggest problem was, that usually Imperial camo take large amoeba shapes edged in a light colour. But to be honest… every version I tried on these looked extremely poor and turned me off the idea. So in the end, I decided to break with the Imperial norm and go for a pattern of thin branch or lighting shapes. And it worked fine. Up next were the helmets and I always wanted something that enhanced their sinister looks. So a skull pattern was painted on the lower parts of the helmets. I have to say, the first one was OK, after another three I thought “why did I decide to do this” but after the 6th one (when I had found my mojo) they became fun. The visors were painted red as usual. Taking another break from the Imperial norm, I did not want their national insignia to stand out as much in blue, white and red. So I painted them in a subdued pattern of dark grey first, but that made them virtually disappear against the armour. In real life that would be the intention and fine, but here i wanted more contrast. I went for a de-saturated version in lighter bluish grey, which offered a nice contrast. The rest was just the standard fare, except that I did not paint their straps and holsters in green but black. The last matter to decided upon was their bases. 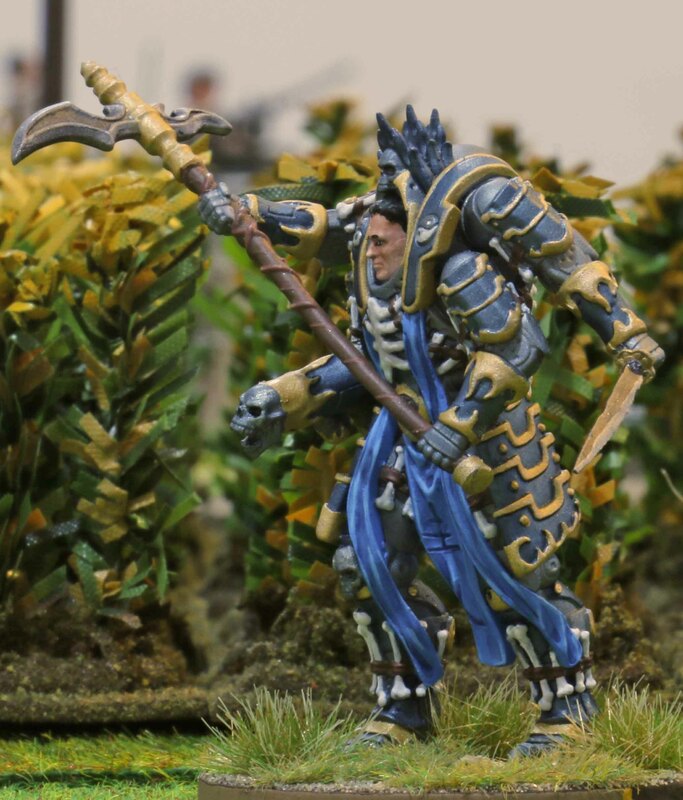 When I started, I had wanted to do the same trench and mud theme, that I have used with the other model for Imperial. Painting them, I realized, that mud would look strange on these and space ship corridors would be much better. Luck would have it, that just the week I finished the minis, my pads from the Basius 2 Kickstarter would arrive. One of the two pads was one I want to use for deck plates when my Alien vs. Predator minis arrive, so I decided to put them to the test. They worked out fine, after a few tests. I have to say though, that they are removed best using pliers to pull them up straight. The thin MDF bases I am using can cause some problems doing that, especially with the water you use as a mould release for the Green Stuff). So some of the bases, it did not work perfectly and the details look a bit soft, but I am still happy with them. Well I imagine you would not want to be in some huge steel coffin flying through space when these chaps come for you… or would you? So last month, I posted, that I had wanted to keep a steadier flow of posts on this blog. So far so good. Just a few days later we were supposed to get high-speed internet and that was when things started going down the drain. Here in Germany all the telephone and internet infrastructure is owned by one company (the formerly state-owned provider). If you get your services from a different company (like we do), they only rent the cables. If anything goes wrong, it is still the owners job to correct it. In our case the owner wired us up wrong in the last switch box, so we actually did not get a signal at all. But since we were using another provider. they took their own sweet time to correct the mistake, including appointments for the technician to fix things where no one showed up. So after more than two weeks without internet or phone (except on my mobile) we were back. But it is amazing, how many things you actually need the internet for these days. Which created a huge backlog of things. Once I had worked my way through that, German mail ended their 4 week strike and I had to work my way through the backlog of snail mail. Bottom line is… I am only now back on track. So this will be the second attempt to catch up. I actually took a lot of photos this weekend so there should be enough to post for about a week now. So let’s get started with some minis. Again these are for Warzone: Resurrection. 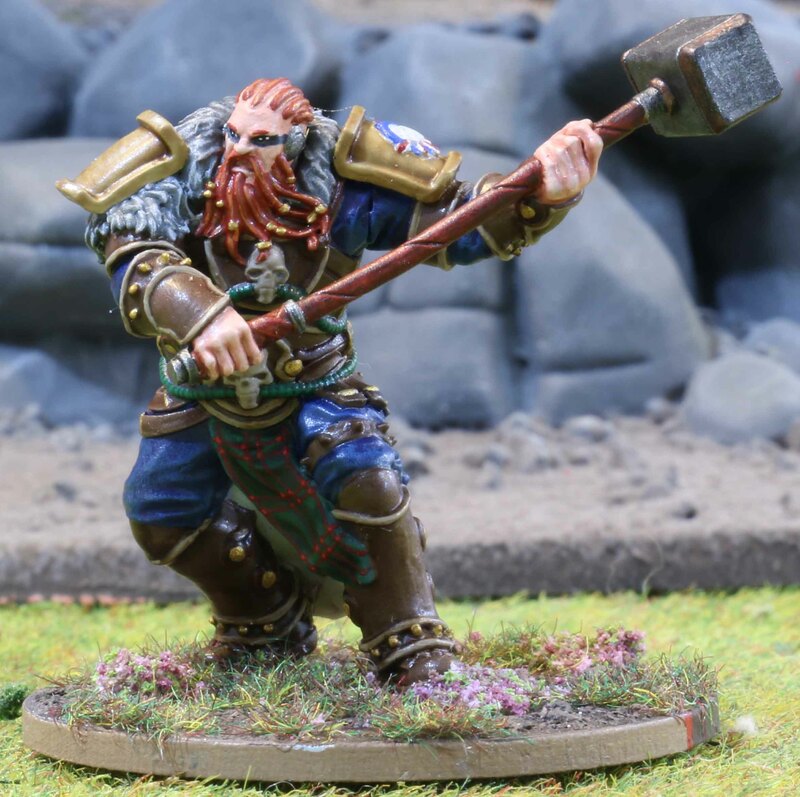 Up first is Timothy McGuire, one of the Warlords for the Imperial faction. He hails from a unit called the Golden Lions. Now as you can see on that link, I painted the unit in classic red body armour. Most times they are also depicted with black-grew tiger stripe camo on their armour. Back then I was unsure if I should do that or not, so I planned to try it out on McGuire (better repainting one mini if it goes wrong than a whole unit). 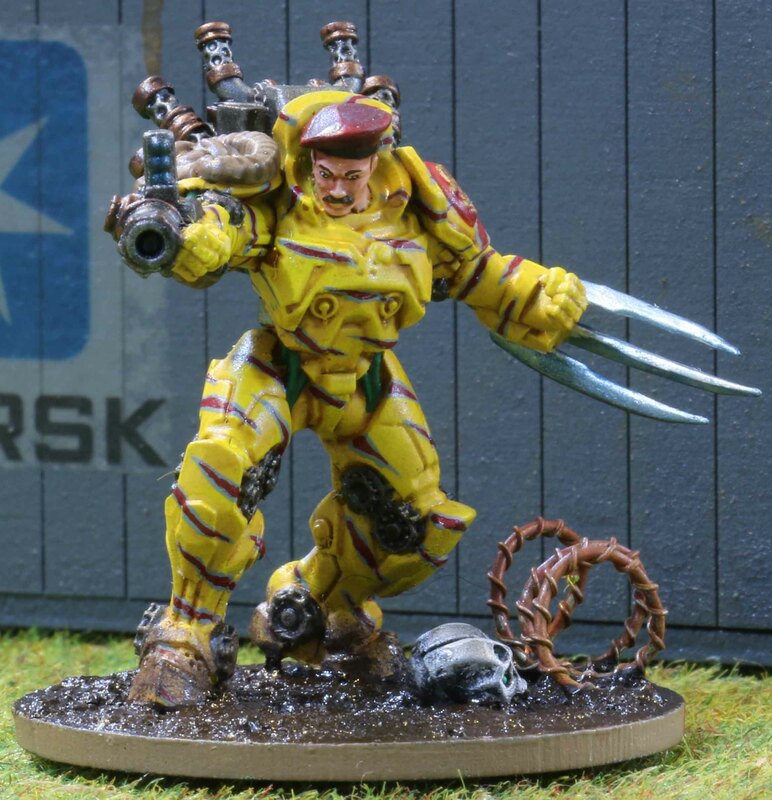 But then Prodos published new artwork of him in yellow armour with blue-grey and red tiger stripes. I felt that looked a bit ugly, but non the less wanted to try how it looked on a mini, so the plan was hatched to paint him that way, which I did. 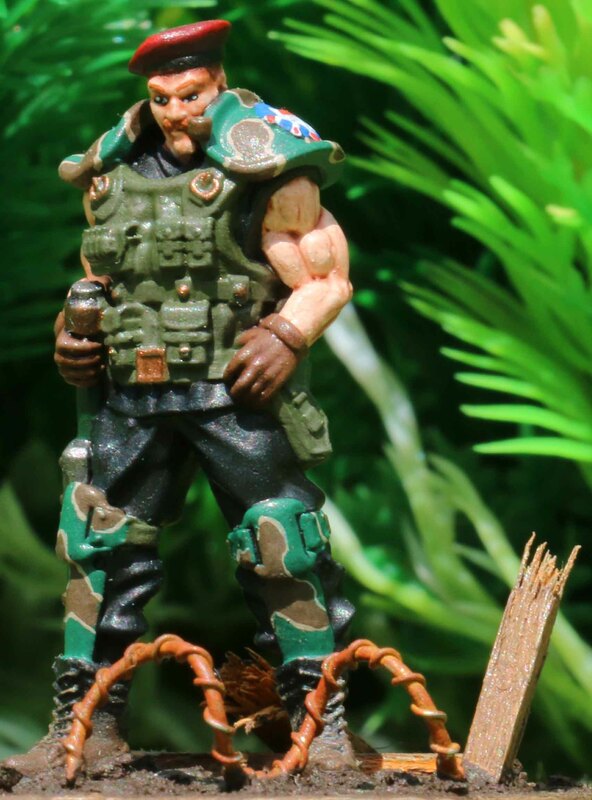 I think the results look a bit strange, since I can imagine no place where such a camo would work, but I like him none the less, so he will stay this way. Looking at the photos though, I think I will have to go back and add some colour to the hinge of the right arm and the valves on his chest plate. Up next are the Pathfinders. 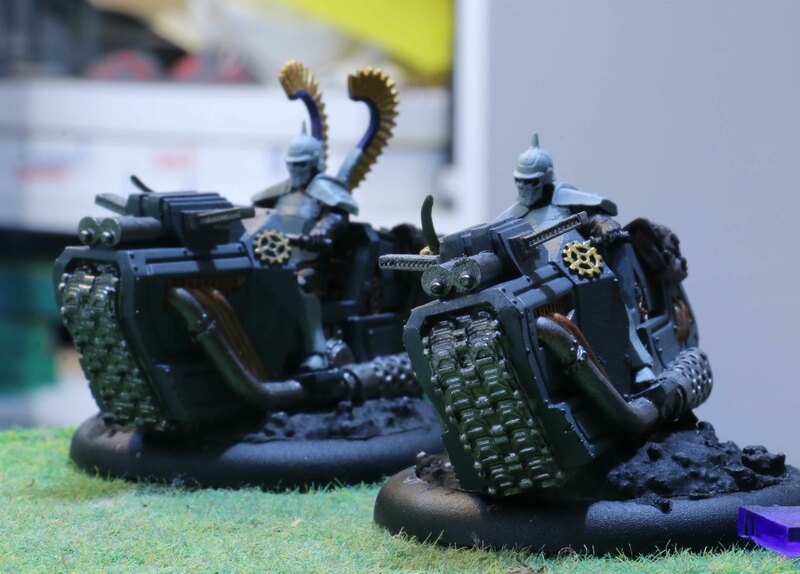 These can be taken either as advisors to squads (essentially making them faster and allowing them to pass through terrain more easily) or as Warlords. The one on the large base is the Warlord, the rest are the advisors. 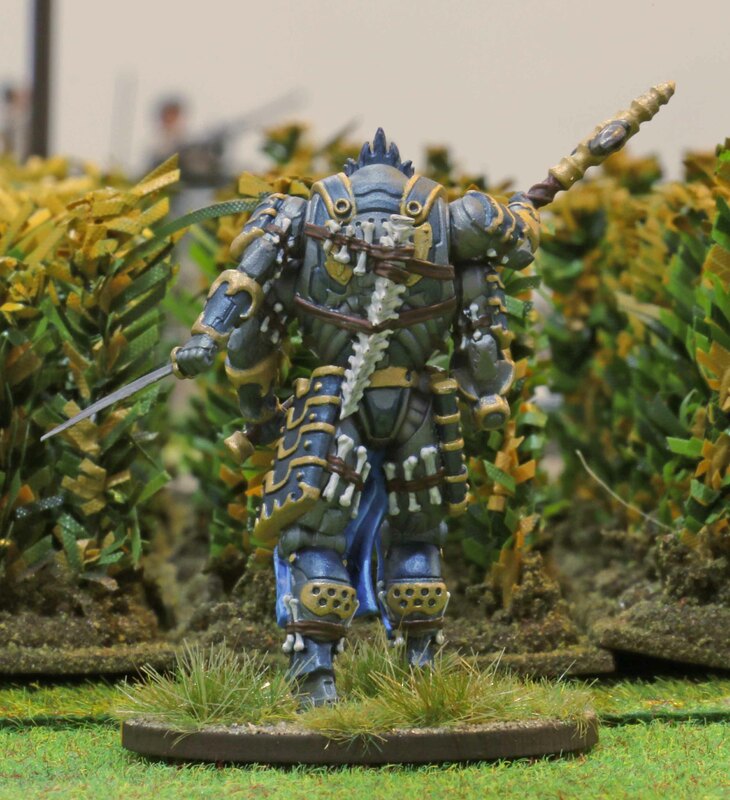 As you can see they are a mix of Oakenfist and Slythe colourwise… blue clothing and lighter brown leather armour. One thing that gave me headaches here were the grenades. As the reader with a keen eye might notice, they have grenade launchers strapped to their right forearm and the corresponding grenades to their right leg (yes I know, they would make more sense on the left legs, since you would have to load them with your left hand). Since they can fire different types of grenades, I wanted to represent that. So some grenades got golden tips, while other had blue or red metallic ones (as in real life). The big problem was, blue did not show up on the blue clothing and red looked strange, so in the end they all got golden tips. They other thing I am still unsure about is their faces. They are supposed to have blue tattoos on their faces, but I did not like that though too much, since I felt it might ruin the character of their faces, so I did without those. On the other hand it does not fit the background, so I might still go back to them, but I guess I will decide that once I have most of the Wolfbanes painted! Up first are one advisor and the Chieftain. 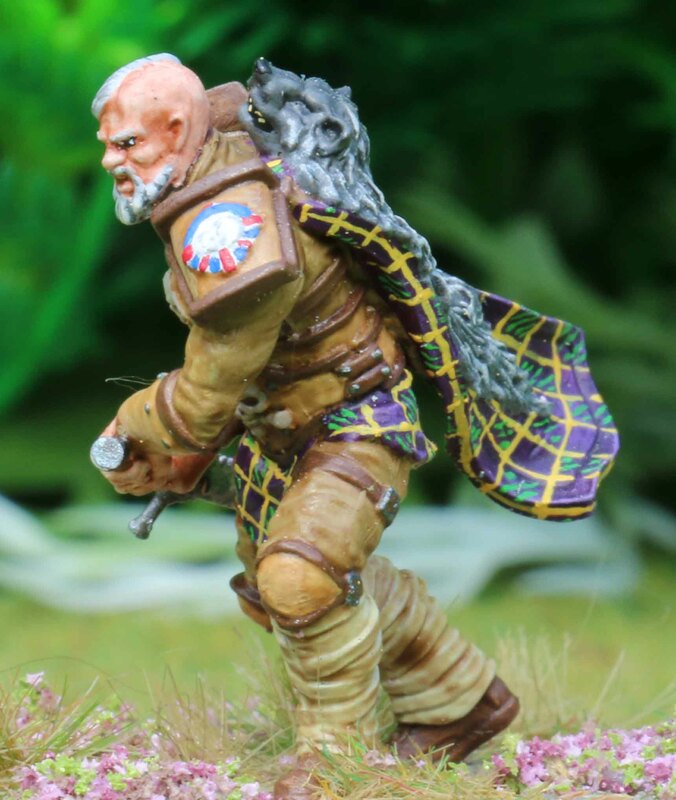 The advisor is sporting my Murdoch tartan, while the Warlord wears a pattern based on Clan Munro. 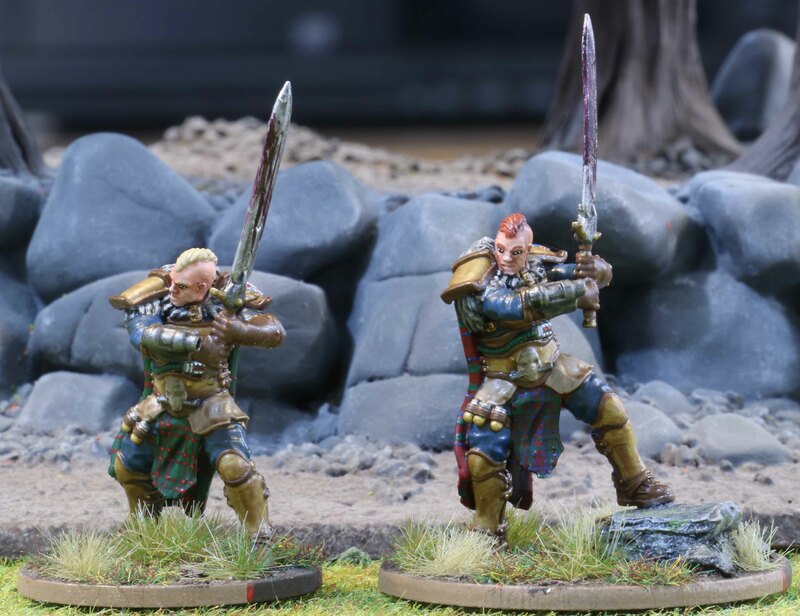 Since my unit is based on the Black Watch, I felt that it would be nice to have a Warlord that features the same colors as their first commander. Plus it is yet another homage to Runrig. And another two advisors. 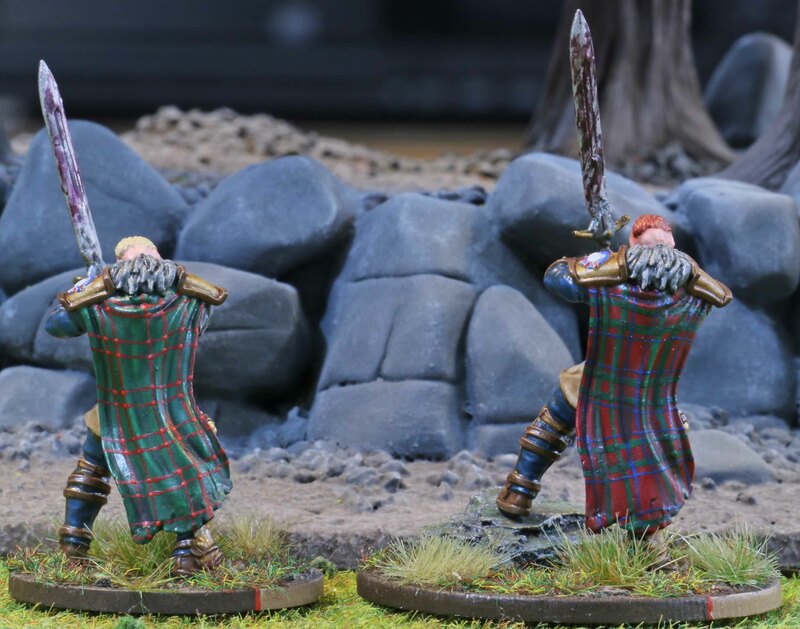 The one on the lest is wearing a tartan based on clan Stewart and the right one a Government tartan. Both patterns have a strong association with the Black Watch (the former is their pattern, the later was often worn by their pipers), so these just felt the way to go. 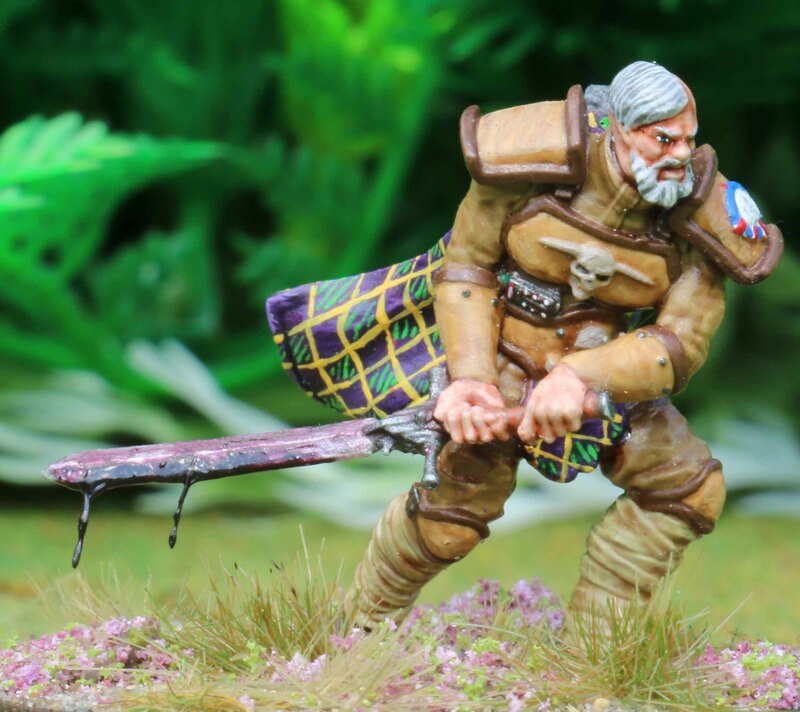 All these patterns will feature strongly amongst my Wolfbane forces, although i could kick myself for the Munro and Steward patterns, since they take a bleeping long time to paint! Live has been extremely busy over the past few weeks. So much to do (both private and work related) that I hardly found any time for the hobby related things in life. I guess not much will change in the near future, but at least I try to update this blog from time to time. And this shall be the start. These are the minis I managed to paint recently, all of them Imperials for Warzone. Not much really, as some of these were painted as much as two months ago. 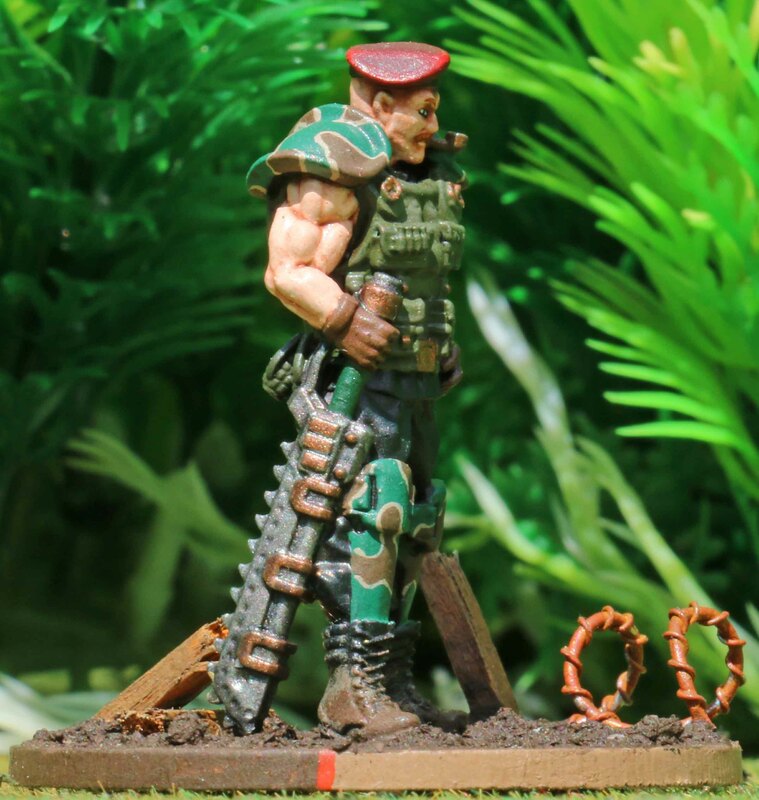 These are two special Blood Beret characters for Imperial. I have to say, I was not too much in a mood to paint these. 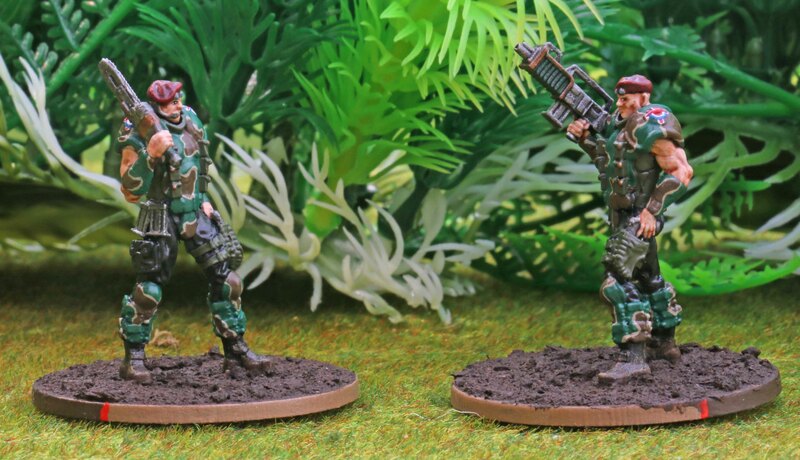 They are limited edition miniatures from the Kickstarter era of Warzone Resurrection. 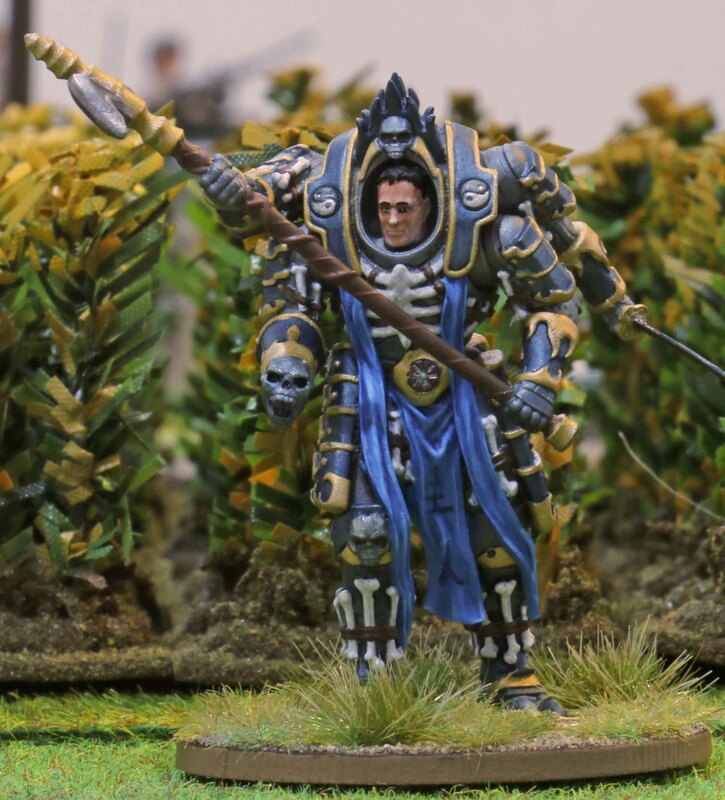 As such they are noticeably different in style in size from the current Imperial models. Therefore I really hope that they will be re-done in due time and until then I will probably not use them too much (which is also underlined by the fact, that they are pretty expensive points wise). As a result my motivation to paint them was not too high, but I did anyway. Now Alfreds was a team member of Drougan and Farraday´s before they became Cartel Agents. He costs as much as the other two, but I like his stats and abilities better than theirs. 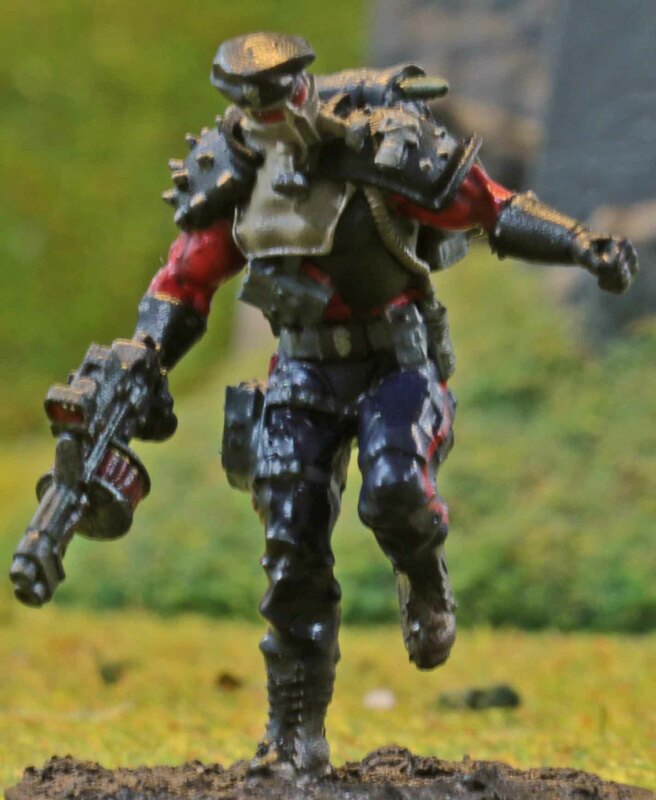 Plus his model is from the recent models that were created to accompany the Mutant Chronicles RPG rules, so he actually fits the current style. 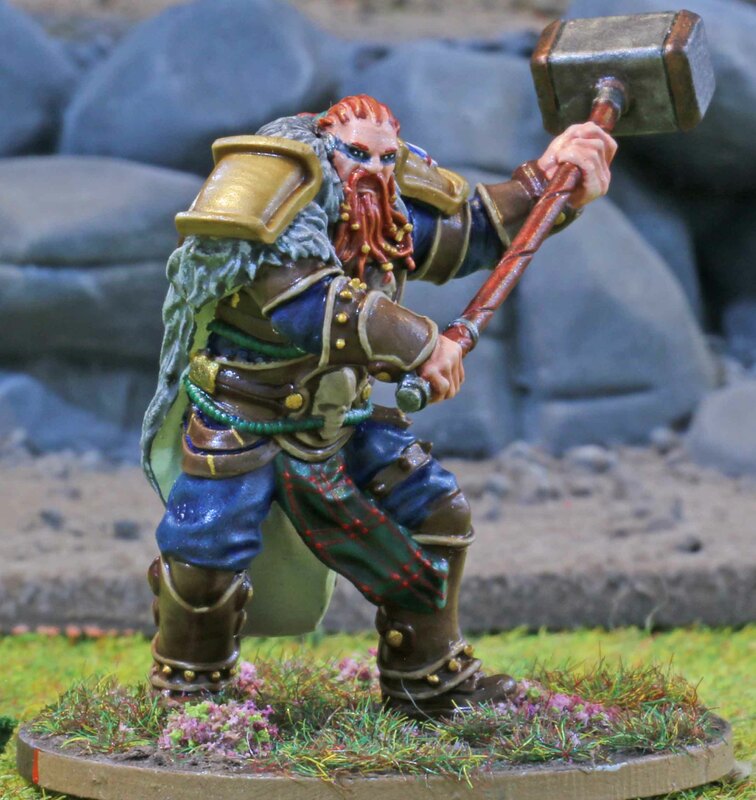 Slythe is another model from the RPG. I really like this model, since I felt that the pose was quite cool and I liked his resemblance to Ewan McGregor. 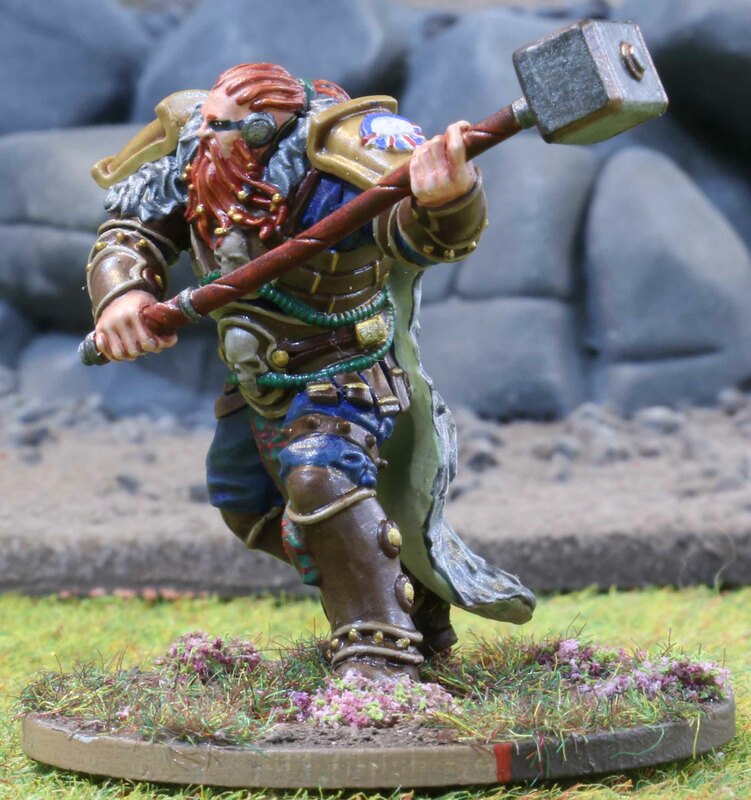 I got this model shortly before Prodos released their Wolfbanes last month, so I painted him as a test piece for the other Wolfbanes. I actually like the way he ended up, but I am not sure if I went for too much tan and brown here. In the end I loosened everything up by adding a (fantasy) tartan pattern to his cloak. The blood dripping from his sword was a late addition to the mini I made, but I think it really enhances his ferocious looks. 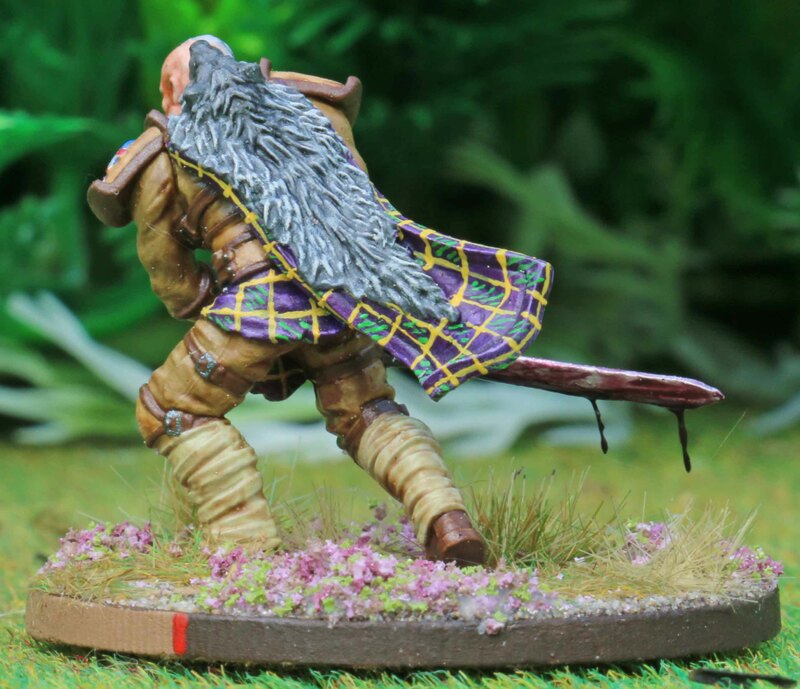 Also went for a different basing theme with him (as I will for the other Wolfbanes)… Highlands instead of trenches. 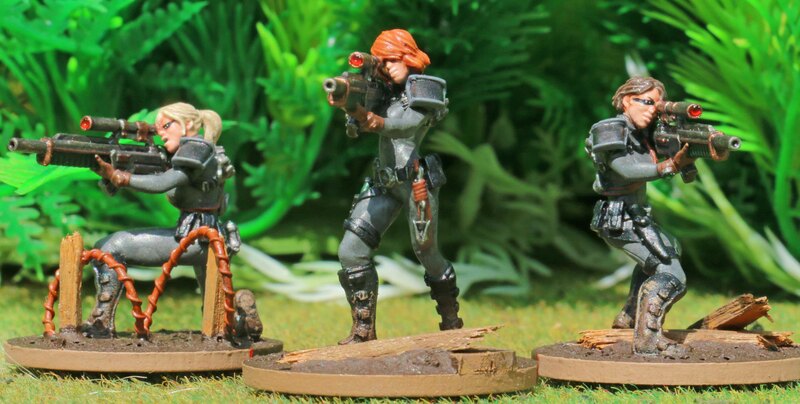 The are the first of the new Imperial models I painted, a three women squad of Grey Ghosts. They act as saboteurs and snipers. Their trademark is the dark grey catsuits and I went along those lines. I am still a bit torn about them game wise. They are pretty expensive, but they might also be quite effective. I used them in a game last weekend and while they earned their points, I think you need the right types of enemy troops for them to do so. Lets see how they play out in the long run! 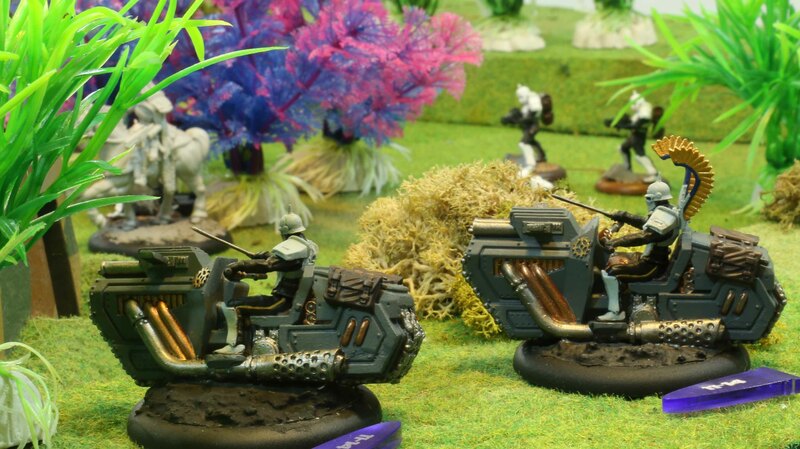 The last infantry unit for this post is a squad of Imperial Special forces, or in this case Sterlings. There are nearly two dozen different Special Forces units one can pick from. To be honest, game wise they are no different from one another, as they can all receive the same equipment and so on. But they all differ when it comes to fluff or their uniforms. So I bought 6 packs of them and wanted something I could go wild with for the first unit. So it is the Sterlings, which wear desert camo. The plate armour was inspired by the US “Chocolate Chip” camo made famous during Desert Storm. Underneath they are wearing 3-color Desert DPM, although I think I could have left that off, since so very little of it can actually be seen under all that plate. 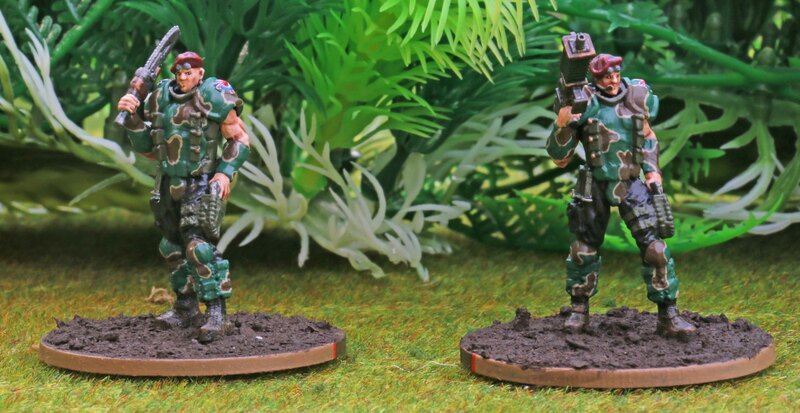 I slightly modified these minis with scopes and laser designators from Anvil Industries. I have the option to use Offensive and Defensive Sentry Tokens with my Imperials in the game. They are not sure to arrive on the tabletop, since I have to draw the right cards, but if they do they are mighty effective. So I often use them and I always disliked the fact, that I had no designed tokens. So I bought these small robots from Anvil Industries and based them accordingly. The HMG ones are the Offensive ones (since they have stats very similar to an HMG and fire at targets of my choice) the grenade launcher ones are the defensive ones (they react to enemies firing in their vicinity). To give my opponents another method to identify them, the Offensive ones are designated by a small Greek letter Ω, while the Defensive ones sport a Greek letter ∆. 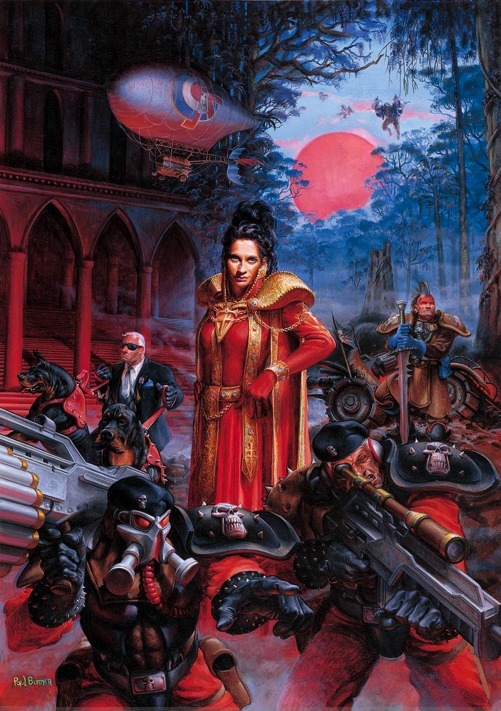 Last year Modiphius Entertainment ran a Kickstarter to launch their Mutant Chronicles RPG. 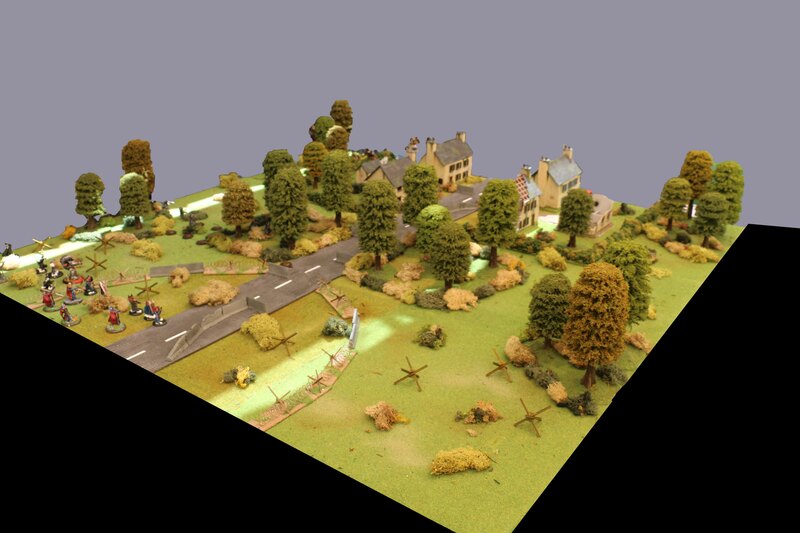 For those who do not know… it is the same universe as Warzone, with Warzone being the wargame. 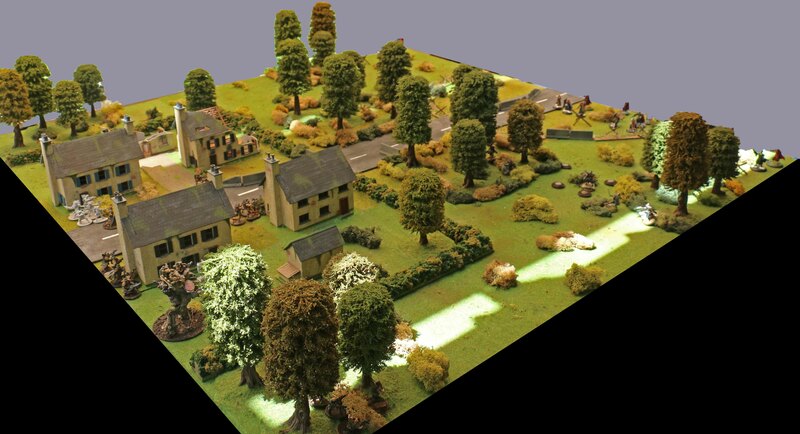 Anyway, the Kickstarter contained a number of miniatures for use with the Wargame, so I pledged. The fact that I will also get the RPG books in PDF format is a little icing on the cake. Now I had planned to paint the Imperial set up first, but sadly, that one was accidentally not shipped along with the rest and will go out this week, so I had to choose something else. I am in no mood to paint Bauhaus or Mishima right now and I am still waiting on base stamps for Dark Legion. So I picked something of universal use… Corporate Agents. So, what are Corporate Agents actually? Well when the megacorporations that had essentially taken the role of governments left Earth they began battling each other with their military might. In order to have a forum where the corporations could discuss their differences on a purely diplomatic level, without having to resort to hostile activities, the Cartel was created. The Cartel has, with the appearance of the Dark Legion, been given a more aggressive role and extended authority to battle the new evil. This was the one place the corporations could pool their resources together to stand against the Darkness. One of their assets are the Corporate Agents. They act as an intel service trying to find and weed out Dark Legion sympathizers and as bodyguards for high value figures from the corporations. 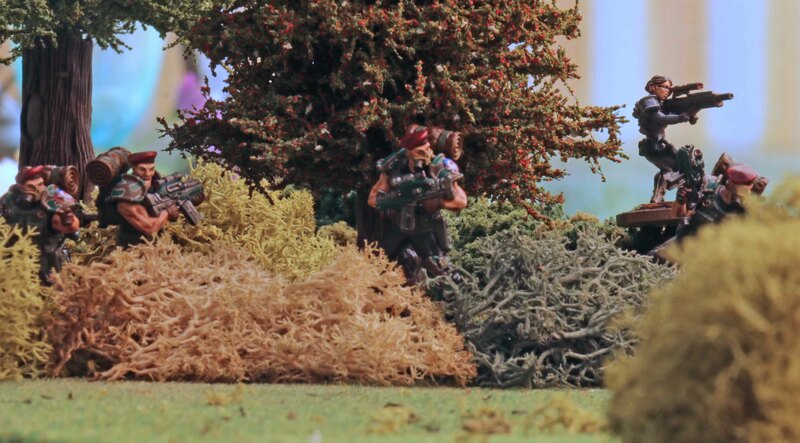 And this is, what they do in the wargame… act as bodyguards. The set consists of two types of miniatures. The first are three actual corporate agents. Looking at the minis, the two male versions instantly reminded me of a certain movie. Want to have a guess? So the choice how to paint the minis was easy. Although all the black suits and ties made them slightly boring, so they at least got brown shoes and belts (were visible) to break that up. Although the facial features and the hairdo does not completely match I also painted the two male agents up to be inspired by Tommy Lee Jones and Will Smith. The basing gave me some headaches. They can be used in virtually any non-Dark Legion force, so I wanted their basing to be generic. 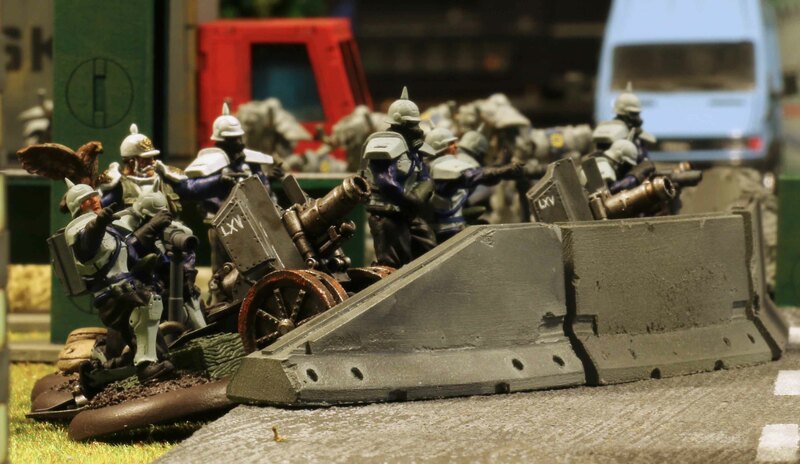 The high heels of the female agents suggested an inner city type of basing, but that is what I will be using for my Dark Legion, so I felt it would be strange, if they blended with the bases of those troops they can not join. So in the end I went for some summer grass ground, like I did on my Brotherhood minis (which serve as auxiliaries for other armies as well). They other thing that gave me a headache was the varnish. I varnished them matt on Saturday evening only to find that it had formed small bubble in some crevices over night. I was able to fix that on most of the minis, although one can unfortunately see some of them on the back of the black agent and the dogs on close inspection. But I was in no mood to strip these, so they will have to do. Squad Upgrades: The squad may be increased by up to three Corporate Agents for 14 points per model. Up to 2 Corporate Agents in the squad may be replaced with an Iron Mastiff for free. 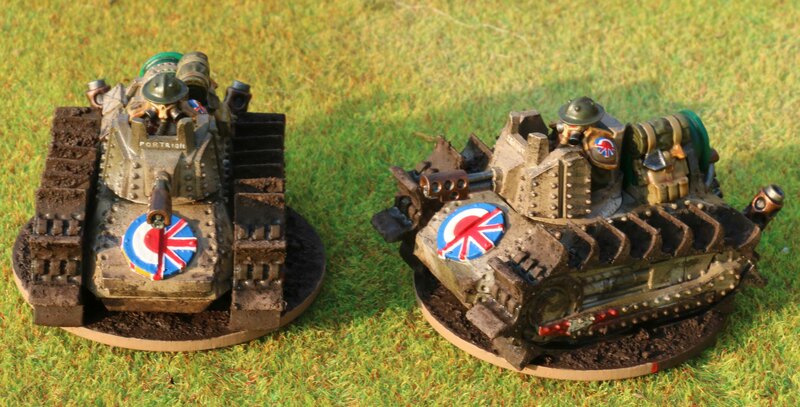 So after that small excursion to Mishima I returned to Imperial, namely two Greyhound tankettes. These are ridiculously small one man tanks, used either to fire poisonous gas in a flame thrower type attack (the version depicted here) or as a short-range vehicular mortar. 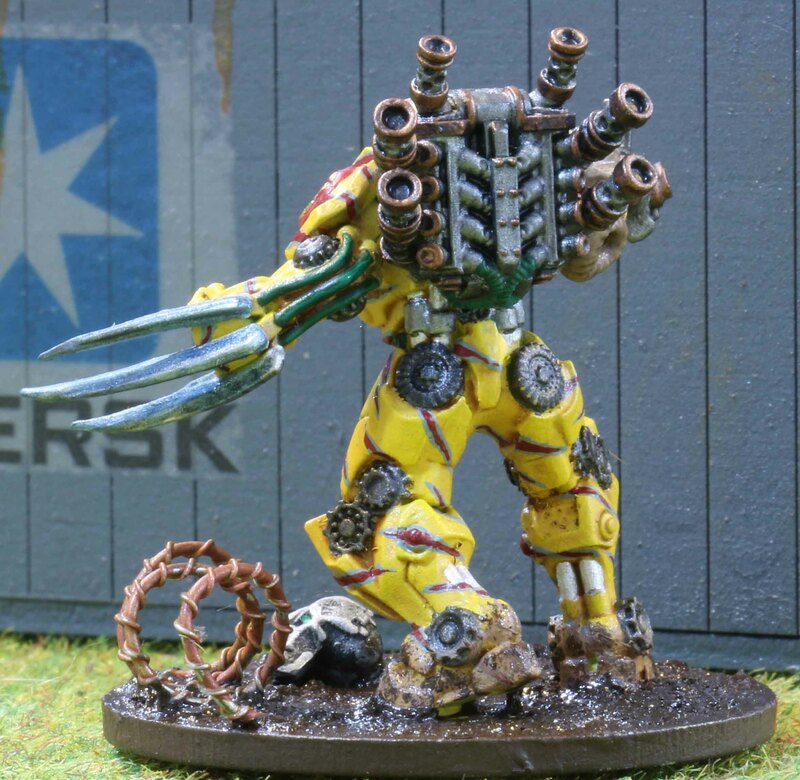 Personally I am not sure if I would have bought them, since a) I find the models a bit ugly and b) for slightly more points I can get a Hurricane Walker, which can do far more! 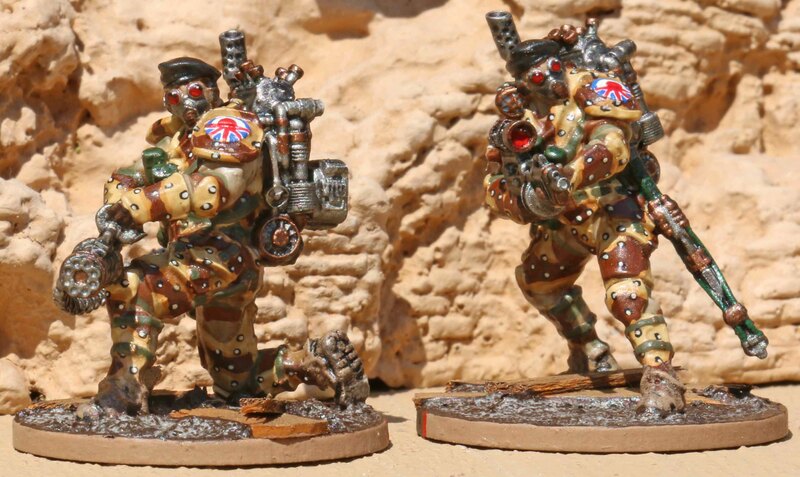 Otherwise, I went for the same camo I used on my Hurricanes, although it looks far less effective on these small models, and the same beat up and muddy look as the rest of the army. I also added WWI or WWII desert style red-white-red tank markings to the sides, but these are mostly covered up by the dirty and wear by now. 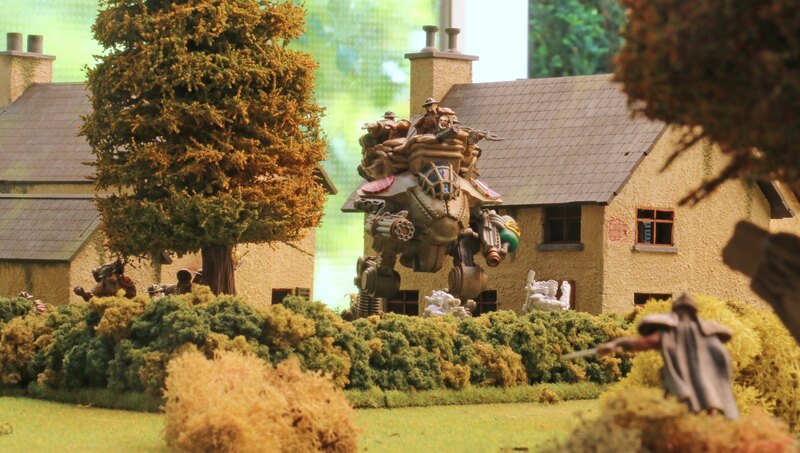 Since the unit I play is loosely based on the Black Watch, they both got Scottish town names on the turrets. One is Peairt (Perth) to other Port Rìgh (Portree).